How can I tell the difference between common complications and negligence that might be Missouri malpractice? No two people are exactly alike. One person may undergo an operation with no complications, while another person undergoing the same operation has continuing health issues months later. If you're the latter, you may be in continuing pain and extremely frustrated. You may be wondering whether your healthcare provider did something wrong and why this is happening to your body. In any medical procedure, complications can arise, even serious ones. This makes it even harder to determine whether what you're going through now is an expected complication or a case of medical malpractice in Missouri. Typically, you should have been notified ahead of time of possible complications arising from a specific medical procedure or possible side effects of a particular medication. However, this “notification” can be as simple as a paper handout that you never even read. If you were rushed into the emergency room, that paperwork may have been left for later or in the hands of another family member. If necessary, request another copy of the possible complications to see if your current problem is listed. If not, then you may want to look further into the possibility that your doctor, nurse, or another healthcare provider made a critical mistake that contributed to your current condition. 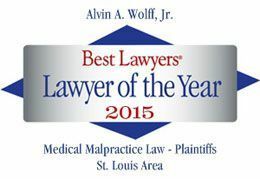 When you suspect medical malpractice, it's always a good idea to have an experienced St. Louis medical malpractice lawyer take a look at your case to determine whether malpractice is evident. Alvin Wolff represents such high-profile cases as Regina Turner's botched brain operation, and he will be glad to meet with you regarding your situation. For a free consultation, call 314-241-2500. When you come in for your appointment, pick up your complimentary copy of The Guide on How to Pick a Lawyer.